I have to admit, when it comes to finding little luxuries, I'm completely drawn to unnecessary necessities. After a long day, running by Nordstrom to pick up a new scent or coming home to a package from Design Darling can turn around my day in an instant. Most days I'd rather have a cute zebra tray sitting around than a stylish piece of clothing. What can I say? It's the little things in life that make all the difference. Enter to win one of my favorite things, this Jonathan Adler Zebra Tray below! What an adorable tray! Would love to win! Amazing giveaway! I love it! Fingers crossed! I have been searching high and low for this tray - I hope I win! So cute! Thanks for an awesome giveaway! 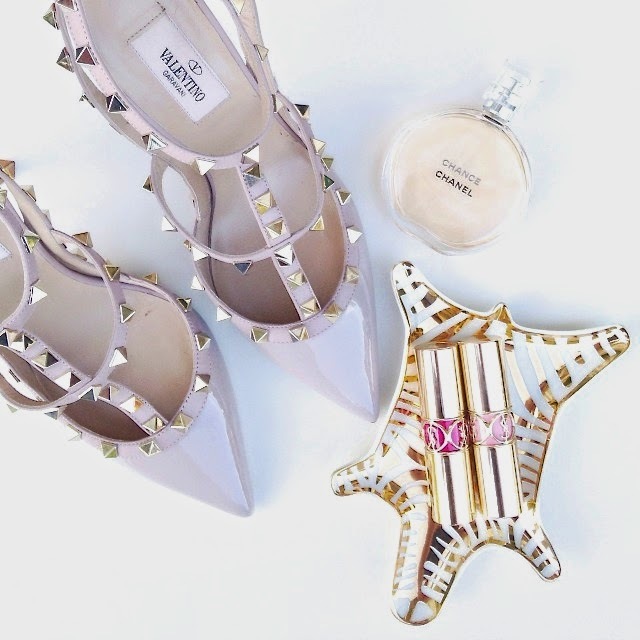 That tray is too pretty and those Valentino shoes- gorgeous!! So adorable!! I'd love to have this tray on my dresser... It'd be the best spot to place my everyday rings and bracelets that otherwise get taken off randomly around my room :) Hope I win! I love this tray! Thanks so much for the opportunity! rockgirl105@hotmail.com (I use that e-mail more often). I think it is so important to enjoy the simple things in life but once in a while splurge and buy yourself something special! Adorable tray! This tray is absolutely adorable! Fingers crossed! That tray is so cute!! Great giveaway! I love the shoes! I've been looking for something to put my everyday rings and bracelet in...this tray is gorgeous and would be perfect!! I have been eyeing these beautiful little trays for awhile!! Thank you for the giveaway! great picture! the valentinos will have to stay on my wish list, but i doubt i'll be able to resist buying the adorable tray. thanks for the inspiration!